Arjen Robben scored on his return from injury as Bayern Munich beat Cologne to become the first team to win their opening 10 Bundesliga games. 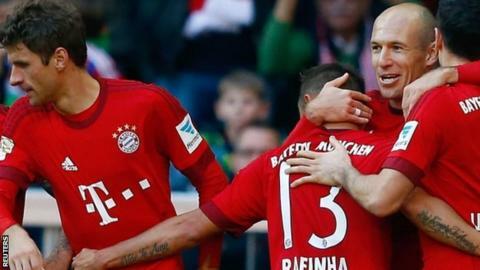 Pep Guardiola's side increased their lead to 10 points in their bid for a fourth successive German title. Robben, 31, scored with an individual effort after 35 minutes and Arturo Vidal added a second before half-time. Robert Lewandowski's 16th goal in nine games and a Thomas Muller penalty sealed a 1000th Bundesliga victory. Bayern were rarely stretched as they returned to winning ways after their first defeat of the season at Arsenal in the Champions League on Tuesday. Robben had been sidelined for seven weeks with a thigh injury picked up on international duty for the Netherlands in the 1-0 defeat against Iceland last month. But he showed few signs of his layoff, and had already wasted one good chance when he put his side ahead with a composed finish. Vidal found the net five minutes later with a low right-foot shot after good build-up play by Kingsley Coman. Lewandowski headed in Douglas Costa's 62nd-minute cross for his 23rd goal of the season. Thomas Muller claimed the fourth from the spot with 13 minutes left, finding the bottom corner after Dominic Maroh fouled Lewandowski. The leaders could see their advantage cut on Sunday with second-placed Borussia Dortmund hosting FC Augsburg. Schalke, who are third, visit Borussia Monchengladbach. Guardiola's side return to action against German Cup holders Wolfsburg on Tuesday in the second round of this season's tournament. Elsewhere, Werder Bremen won 3-1 at Mainz, and Eintracht Frankfurt earned a 2-1 victory at Hannover. Wolfsburg stay fourth after scoring the only goal at Darmstadt,Hertha Berlin are fifth after a 1-0 win at Ingolstadt, and Bayer Leverkusen beat Stuttgart 4-3. Match ends, FC Bayern München 4, 1. FC Köln 0. Second Half ends, FC Bayern München 4, 1. FC Köln 0. Marcel Risse (1. FC Köln) wins a free kick on the right wing. Jonas Hector (1. FC Köln) wins a free kick on the left wing. Attempt missed. Robert Lewandowski (FC Bayern München) header from the centre of the box is too high. Assisted by Philipp Lahm. Substitution, FC Bayern München. Thiago Alcántara replaces Thomas Müller. Goal! FC Bayern München 4, 1. FC Köln 0. Thomas Müller (FC Bayern München) converts the penalty with a right footed shot to the bottom right corner. Penalty FC Bayern München. Robert Lewandowski draws a foul in the penalty area. Penalty conceded by Dominic Maroh (1. FC Köln) after a foul in the penalty area. Substitution, 1. FC Köln. Dusan Svento replaces Yannick Gerhardt because of an injury. Attempt blocked. Philipp Hosiner (1. FC Köln) right footed shot from outside the box is blocked. Attempt blocked. Douglas Costa (FC Bayern München) left footed shot from the right side of the six yard box is blocked. Assisted by Thomas Müller. Attempt saved. David Alaba (FC Bayern München) left footed shot from outside the box is saved in the centre of the goal. Assisted by Douglas Costa. Substitution, 1. FC Köln. Philipp Hosiner replaces Simon Zoller. Attempt saved. Joshua Kimmich (FC Bayern München) right footed shot from outside the box is saved in the centre of the goal. Assisted by Douglas Costa. Attempt saved. Robert Lewandowski (FC Bayern München) left footed shot from the centre of the box is saved in the centre of the goal. Assisted by Thomas Müller. Attempt blocked. Joshua Kimmich (FC Bayern München) right footed shot from the centre of the box is blocked. Assisted by Kingsley Coman. Dominique Heintz (1. FC Köln) wins a free kick in the defensive half. Substitution, FC Bayern München. Joshua Kimmich replaces Arjen Robben. Attempt missed. Simon Zoller (1. FC Köln) header from the centre of the box misses to the right. Assisted by Yannick Gerhardt with a cross. Goal! FC Bayern München 3, 1. FC Köln 0. Robert Lewandowski (FC Bayern München) header from the centre of the box to the centre of the goal. Assisted by Douglas Costa with a cross following a set piece situation. Substitution, FC Bayern München. Javi Martínez replaces Jerome Boateng. Matthias Lehmann (1. FC Köln) is shown the yellow card for a bad foul. Foul by Matthias Lehmann (1. FC Köln). Attempt blocked. Arturo Vidal (FC Bayern München) right footed shot from outside the box is blocked. Assisted by Arjen Robben with a cross. Corner, FC Bayern München. Conceded by Jonas Hector. Attempt saved. Arjen Robben (FC Bayern München) left footed shot from outside the box is saved in the bottom left corner. Assisted by Douglas Costa. Substitution, 1. FC Köln. Yuya Osako replaces Anthony Modeste. Rafinha (FC Bayern München) is shown the yellow card for a bad foul. Anthony Modeste (1. FC Köln) wins a free kick in the defensive half. Attempt saved. Robert Lewandowski (FC Bayern München) right footed shot from the centre of the box is saved in the centre of the goal. Assisted by Arjen Robben. Attempt missed. Kingsley Coman (FC Bayern München) right footed shot from outside the box is high and wide to the right. Assisted by Douglas Costa. Attempt saved. Matthias Lehmann (1. FC Köln) right footed shot from outside the box is saved in the centre of the goal. Assisted by Kevin Vogt. Attempt missed. David Alaba (FC Bayern München) header from the centre of the box is high and wide to the left. Assisted by Arjen Robben with a cross following a corner.